That programme can be viewed in the UK on BBC iPlayer here or as a Youtube video here. 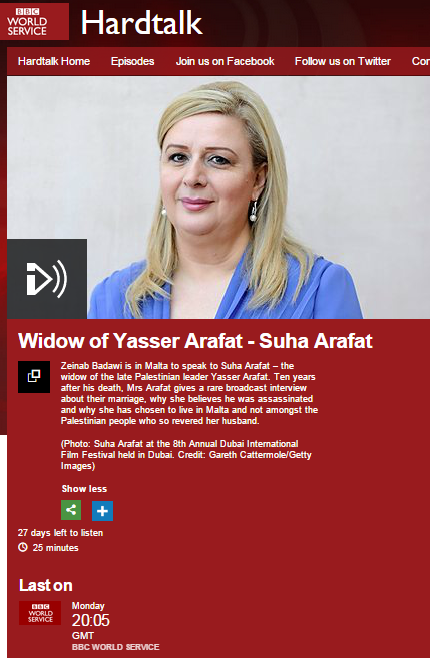 An audio version was also produced for the BBC World Service and clips from the interview were promoted on the BBC News website’s Middle East page and on the Hardtalk webpage. Badawi herself fails to distinguish between civilian casualties and terrorists when she says that “two thousand people died in Gaza in July and August last year” and her description of Mahmoud Abbas’ signing of the Rome Statute in order to join the ICC as “some progress being made on the diplomatic scene” is of course both creative and revealing. Far from having even a whiff of “in-depth” or “hard-hitting” about it, this puff piece interview not only does nothing to provide audiences with a realistic view of the man who is the only reason for this woman being interviewed (the word terrorism, for example, is not mentioned once), but audiences are treated to hefty doses of clichés such as “iconic leader”, “great leader”, Arafat’s “legacy” and “hero of the Palestinian cause” from both interviewer and interviewee. That, together with the fact that this programme was made for the reasons stated by the BBC itself, says it all. “co-presented Channel 4 News with Jon Snow”, “educated at SOAS” – that says it all about this repulsive woman. Hey, maybe this “journalist” could find out what she did with the over NINE HUNDRED MILLION dollars she stole from the “Palestinians”! The BBC has so lost the plot, just like a very large proportion of the so-called intelligentsia in Britain. This is what a dying civilisation looks like.